I received this cute set of dies as a Christmas gift and decided to make a birthday card with them as we personally know a few farmers in our area. I sponged the sky with tumbled glass ink, then added a few layers of grass and a white fence; both done with a SNSS border die set. The sun is by Lil Inker in both the large and small size and was dotted in the center with an orange stitched die negative left over from a previous project. The bird is from a MFP stamp set and the sentiment is by SNSS. As for the barn and piles of hay, they're all included in the die set and I used snippets of card stock to cut everything. as well as the Cute Card Thursday Challenge #564 - what's new? How cute scene you have created with this farm! Love the black barn and the layers of grass with the white fences, but over all love your cloudy sky, so delicate and effective! The stitched sun is a so pretty detail! Hugs! Hope that all is going well for you! A super card Carol, it looks like a super die set. This super cute and I love the little barn scene you made. Fantastic work with all the die cuts. Great sky too. A SUPER card, love the dies and how you have used them. Oh, how cute with that little crow! You did a great job with the barn die. Love this card. What a perfect card for a farmer. 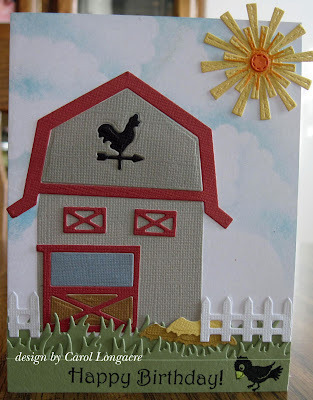 I like the barn door and the scene you created for this card.